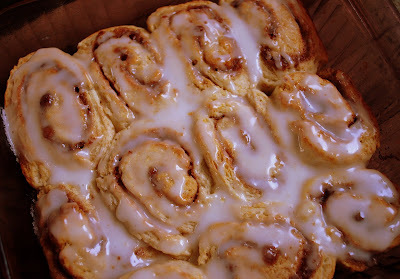 I toyed with calling these Cinnamon Rolls then I thought about calling them Cinnamon Biscuits. 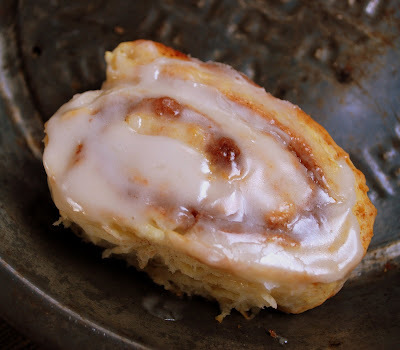 In the end I decided on Cinnamon Biscuit Rolls to cover all my bases cause they really are like a cross between a true cinnamon roll and a flaky biscuit. Preheat the oven to 450. In a large bowl combine the flour, baking powder and the salt. Cut in 4 tablespoons of cold butter until the mixture resembles coarse crumbs. Stir in the milk until just moistened. Turn onto a lightly floured surface and knead gently 8 to 10 times. Roll into an 11 x 8 inch rectangle about ½ inch thick. Melt the remaining butter and brush one tablespoon over the dough. Combine the sugar and cinnamon and sprinkle over the butter. Roll it up jellyroll style starting with the long edge. Cut into equal slices. I did this by first cutting it in half, then in half again, etc. I ended up with 11 piece cause the end piece was just to small. Place cut side down on a greased 8-inch square pan. Brush with remaining butter. Bake at 450 for 18 to 20 minutes or until golden brown. Cool for 5 minutes. 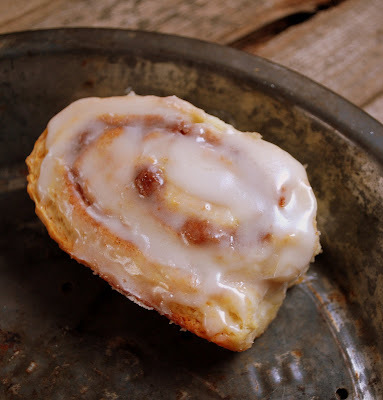 Combine glaze ingredients and spread over warm biscuits. Serve immediately. You know what, I don’t even have to say serve immediately cause when you smell these babies coming out of the oven, it will be all you can do to stop your family members from knocking you down stampede fashion to get to these. They are that good. omg!!! i'm am drooling!!! you can tell how much by all the exclamation marks. love the new banner.. that's probably not so new but new to me i love it anyways! Oh nice and I don't care what you call them...I want them. MY Goodness.. do these ever look good. They are so on my list to try! !